This unit has a cozy back patio, lake view and is close to the main pool and restaurant/bar. You will be getting a 2-bedroom (King bed in master bedroom, Bunkbeds in the second room - full on the bottom, twin on top), 2-bathroom condo, complete with full kitchen and laundry. The second bedroom is Star Wars themes for the young and young at heart. Televisions in every room, private High Speed Wifi/Internet AND many more amenities for considerably less money than a typical 1 or 2 resort bedroom with other Bahama Bay Resort rentals. This is a desirable GROUND FLOOR condo that sleeps 6! (Pro Tip! There are no elevators at Bahama Bay Resort). With our unit you just drive up, enter your door code, walk in and pour yourself a glass of wine. The check in process couldn't be more convenient or easy! Some of the resort's many amenities include 4 heated pools, 6 hot tubs, a children's splash park, playground, video game room, beach, lake, BBQ grills, walking / jogging nature trails, volleyball, tennis, basketball, fishing dock, pool tables, foosball, spa/salon, fitness center, marketplace gifts/grocery, Internet cafe computer stations, library, free coffee/tea 24/7, room service and the 'TradeWinds' on site restaurant. And within a 3 minute drive there are restaurants, a Publix (grocery store), liquour store, pubs, gas station, bank and all sorts of other shops. We are Sean and Wendy Wallbridge. We live in Victoria, BC Canada and have been married for 20+ years! We have two fabulous kids and we love coming to Florida every year as we have the Disney "Bug". In fact, we were going to Florida so much that it just made sense to find a place of our own and then open it up to share with others. We hope you enjoy your stay! We chose Bahama Bay Resorts because of the wonderful Caribbean/Tropical setting and its many amenities. Bahama Bay is a beautiful gated community only 15-25 minutes from the Disney Parks. Our Condo is unique from the others at Bahama Bay as we are a ground floor unit (there are no elevators at Bahama Bay), we provide superior Internet, TV and Phone and tiled floors. In addition, we've tried to think of/provide as much as we could so that you can simply walk up to your unit and start enjoying your stay immediately. Hair dryer included in both bathrooms. Beach towels provided for use within the resort. Living Room Sofa pulls out into a Queen Bed. Fully Equipped, brand new kitchen and appliances. Well organized with everything you need to cook. We have some pool toys (noodles, beach toys, balls, tennis rackets), etc. 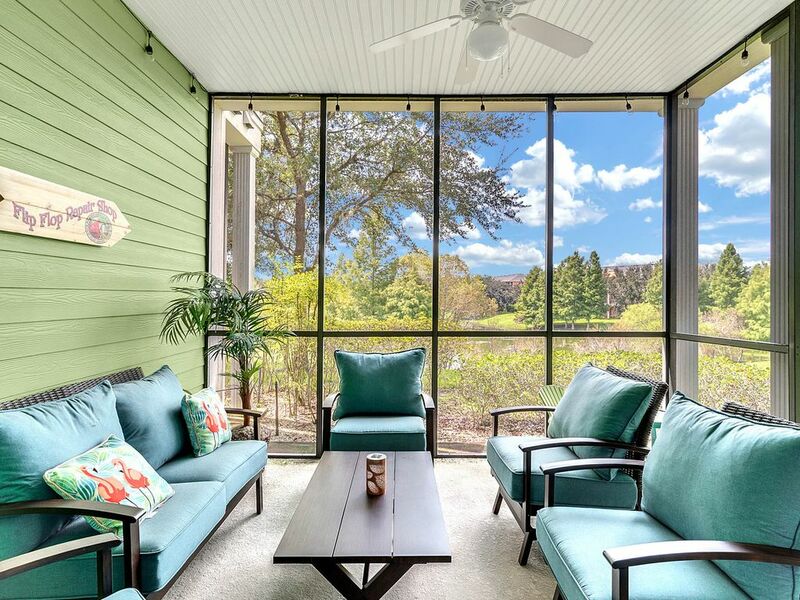 The unit has a large, beautiful screened in patio with comfy furniture and views of the lake, as well as a small seating area off of each bedroom. Our Disney Place is a great place to come home to at the end of a busy day at the parks. We have tried to think of everything to make our guests feel comfortable, happy and relaxed. Bahama Bay is a beautiful Caribbean – Colonial style resort set in 70 acres of tranquil lush gardens. This is the perfect place for a family vacation to Disney. Bahama Bay Resort is set on the banks of the stunning Lake Davenport with its own private sandy beach. This exclusive condo offers perfect luxury accommodation and a relaxing environment. You’ll find it hard to believe you are only minutes from the Disney Theme Parks and Orlando with its shopping malls and international restaurants. Also nearby are some world-class golf courses. The Resort Complex offers a Clubhouse and shop, a restaurant and a variety of outdoor heated pools and Jacuzzis. If you’re feeling energetic, there are sports facilities, or you can just enjoy wandering through the luxurious landscaped surroundings. The Resort has a Beauty Salon and Spa, and there is 24-hour gated security for your complete peace of mind. Your spacious 2-bed, 2-bath condominium is beautifully furnished, sleeps up to 6 and is equipped with everything you can think of including an enclosed patio. You have the independence to cater for yourselves and you can relax and enjoy the privacy of your own home away from home in the beautiful Florida climate.